As messaging capabilities expand within the Internet of Things, voice appears to be a primary focus for new brand engagement opportunities. 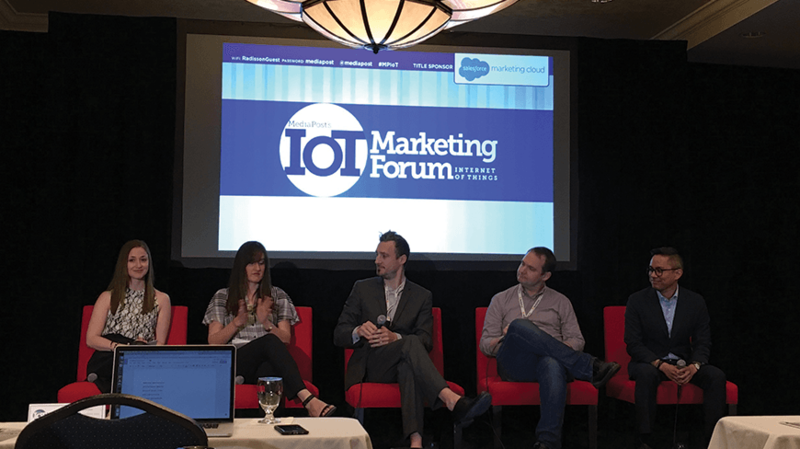 That was the general consensus from a panel discussion of agency executives at the annual MediaPost IoT Marketing Forum in New York this week. While some potential challenges of the screen-less medium were outlined, the group seemed to agree that voice opens up new doors for brands and consumers. As the volume and speed of information transmitted between users and the brands serving them personalized experiences increases, touch input is becoming a limiting factor for efficiency, said Leigh Christie, manager of the Isobar U.S. NowLab. Christie said that personalized brand experiences are increasingly requiring more bandwidth of data, both on the user input and brand experience sides. On the brand side, utilizing data from external sensors and other devices around consumers can provide context to the primary form of communication. That augmenting of communication increases bandwidth, according to Christie. However, using voice is inherently different than screen-based communication in certain regards and can create new challenges for brands and advertisers, according to Michael Miraflor, senior vice president and global head of Futures and Innovation at Blue 449. The solution is to combine voice with some level of artificial intelligence on the back-end to deliver high-quality, personalized results. Merging AI and voice also seemed to be a focus of more than one other discussion and presentation throughout the event. In addition to the dynamics of designing the user experience of voice interactions, the group discussed where these interactions are taking place. The context was mostly centered around the use of digital voice assistants in the home, such as Amazon’s Echo and Google’s Home. In practice, leveraging voice through devices like Amazon’s Echo is currently an added-value approach for brands to extend their presence into a consumer’s pre-existing platform, requiring users who own and use the device, according to Chuck Fletcher, technology director, emerging experiences, at SapientRazorfish. These devices and other connected products in the home can provide a close integration of a brand in a consumer’s life. However, that opportunity requires a more sensitive approach, according to Sara Bamossy, chief strategy officer at Pitch. Of the four agency executives, two said they prefer Amazon’s Alexa platform (Amazon Echo devices) over Google’s Assistant (Google Home) and two said they are undecided.